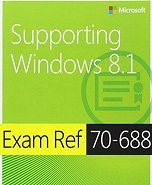 Gain the knowledge and skills you need to support the Windows 8.1 operating system and solve technical troubleshooting problems in a Windows 8.1 and Windows Server 2012 R2 networking environment. This course is designed for IT professionals who have experience with Windows devices and who work as Windows Enterprise Desktop Support Technicians (EDSTs) in Tier 2 support environments. Through this instructor lead, five day Microsoft Official Course, with extensive hands-on labs you will learn how key components of the Windows Operating system work in order to aid in troubleshooting system problems. How to identify and resolve issues with networking, Windows Store apps, security, group policy, Internet Explorer, remote access, and support of mobile devices.